FILE - A counselor holds up cards used to educate women about female genital mutilation (FGM). Soap operas could be a powerful new tool in changing attitudes around female genital cutting, researchers said Wednesday, following a study in Sudan where the ritual remains deeply entrenched. The social scientists said their findings suggest that using popular entertainment could be an effective alternative to harsher approaches like criminalization in persuading communities to abandon the harmful practice. "[Our results] show that entertainment can be used to change cultural attitudes toward genital cutting," said Charles Efferson, a senior researcher at the University of Zurich in Switzerland. Worldwide, more than 200 million girls and women are thought to be affected by female genital cutting or mutilation (FGM), which involves the partial or total removal of the external genitalia. 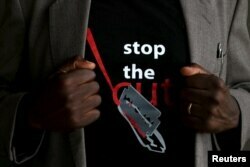 FILE - A T-shirt warns against female genital mutilation. Its wearer attends an event, discouraging harmful practices such as FGM, at a girls high school in Imbirikani, Kenya, April 21, 2016. Many see cutting as a sign of purity and a prerequisite for marriage, while uncut girls risk being ostracized. But the scientists, writing in the journal Nature, said that viewers of a soap opera in which the protagonists gave up cutting had afterwards shown more positive attitudes toward uncut girls. "People like to be entertained, basically," co-author Efferson told a news conference. The team of Swiss and Sudanese researchers produced four movies about an extended family in rural Sudan and showed them to thousands of villagers in more than 120 communities. The films shared the same plot, mixing love and intrigue, but varied on how the protagonists dealt with the issue of cutting. The characters argued over the practice, questioning the cultural belief that it raises a woman's marriage prospects or ensures good morals. Viewers' attitudes were measured immediately after watching the film and a week later. World leaders have pledged to end FGM, which can cause serious health problems and has been internationally condemned as a human rights violation. But the ritual remains prevalent across a swathe of Africa and in pockets of the Middle East and Asia. In Sudan, 87 percent of girls and women aged 15 to 49 years have undergone female genital cutting, according to U.N. data. The scientists said messages embedded in popular entertainment could potentially reach a broad cross-section of the population, in contrast to documentaries which mainly reached those already amenable to the message. Efferson said "heavy-handed" methods risked driving the practice underground. If communities felt outside views were being imposed on them, this could provoke a backlash and even increase cutting, he added.